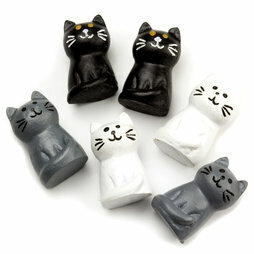 Cats always bring luck, no matter if white, black or grey! They are not just cute but also practical and hold your notes and postcards on any metal surface. A small disc magnets turns each cat into a little muscle man. Who says cats only dream of chasing mice? The cat magnets are delivered in this couch-design package.